This charming vacation home is the ideal setting for a family vacation. Located at the head of Hither Creek in Madaket, it is situated close to a bay beach (5 minute walk), ocean beach (1 mile), island shuttle stop (3 minute walk), bike path (100 yards), public boat launch (0.5 miles) and crabbing bridge (2 minute walk). The first floor contains the kitchen/eating room, family/living room, full bath, 3 bedrooms (2 with bunk beds, 1 with twin beds), laundry/furnace room. The second floor contains 1 bedroom (queen bed), half bath, sitting area and access to private upper deck. Outside, a two level deck provides extended living space. The lower deck offers privacy and is conveniently located off the kitchen & outside shower. Stairs from the lower deck lead to the upper deck. The upper deck offers spectacular views of Madaket Harbor, Tuckernuck Island and famous 'Madaket sunsets'. Additional 5th bedroom located above detached garage. Sleeps two (twin beds) with its own private deck. Additional outdoor shower recommended when returning from the beach. First the pros of this house: The location was very good, 8/10 of a mile from the Madaket beach. The sunsets on the upper deck were beautiful! The house is old but clean. There were plenty of linens/towels/paper towels/toilet paper etc that you don't always find in a rental. This house also allows pets which was a plus for us! Now for the cons: There were very few glasses and maybe 2 wine glasses. The lamps in the bedrooms had no lampshades and one had the bulb hanging off. The cushions on the wicker furniture in the living room are in desperate need of replacing. They are old and worn, making it uncomfortable to sit on them. The adirondack chairs on the upper deck are falling apart and not safe to sit on. I understand that the house is on the market and I'm sure the owners don't want to spend alot of money on updates, but I don't think the things I mentioned would cost all that much. It would make the stay much more comfortable. At the very least the broken chairs and lamps should be removed. We did enjoy our vacation, thanks to the beautiful weather and the proximity to the beach! This house has it all! 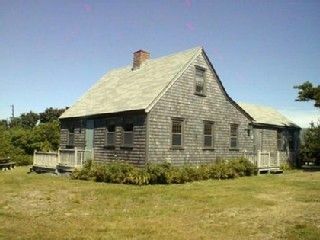 It is comfortable with a great location in Madaket with privacy, space, wonderful decks. Everything we needed was there, including wifi, horses next door, song birds! Wonderful stay. Thank you. From the moment we arrived we were so happy we chose this home. From the classic aged wooden shingles outside to the wood panelling, wood buring stove and classiccottage style decor inside, it was all just what we were looking for. The property is fabulous. The main house has 3 bedrooms (2 with bunks) and a full bathroom on the first floor and a master bedroom with a 1/2 bath on the 2nd floor. The big bedroom upstairs has a sitting area and a deck that faces the water. It's amazing to see such INCREDIBLE sunsets from your very own house!!! The living room is super comfy and there is a HUGE flat screen tv, lots of games and books and a great stereo for entertainment. The kitchen has everything you need to cook and enjoy large or small meals. There is a guest loft with hard wood floors and two comfy twin beds over the garage/workshop with its own entrance only a few steps from the house. There is another deck off of the kitchen with a great wooden table, grill and plenty of chairs. The property is surrounded by large trees and wildflower bushes on 3 sides providing complete privacy and the back of the property is lined with a split wire fence, where the neighbors beautiful horses peek thier heads over in morning to say hello) The marina takes 2 minutes to walk to and the ocean is a mile down the road. In Season there is a great restaurant (Millies) and a small market again less than a mile away. Town was a 10 minutes drive (easy) and renting a jeep for the week was a huge plus. Cisco brewery is an 8 minute drive and there is a supermarket within the same distance. The owner of the house was so nice and made sure we had everything we needed. And the best part? We were able to bring our puppy, who had plenty of room to run during the day and loved stretching out at night on the upper deck with us while we enjoyed a few cocktails, listening to music watching the amazing Madaket sun go down.... We will be back!